Roland Emmerich is the king of disaster movies. Through Independence Day, The Day After Tomorrow and even the less-than-enthusiastically-received Godzilla, he's provided filmgoers with a number of fantastic action and destruction visuals throughout the years. And now he's back, with, yes, another disaster film, this one called San Andreas. Oh wait. Emerich didn't make this film? Weird, since it looks like a direct copy of all his other movies. Turns out, San Andreas is actually made by Brad Peyton, whose biggest film until now was Journey 2: The Mysterious Island. Now, granted, that history isn't necessarily an indication that Peyton doesn't have the directing chops to take on a big-budget action movie like this one. But you know what is? The fact that San Andreas just completely and utterly falls through the cracks. It can't even be justified as a solid action film. 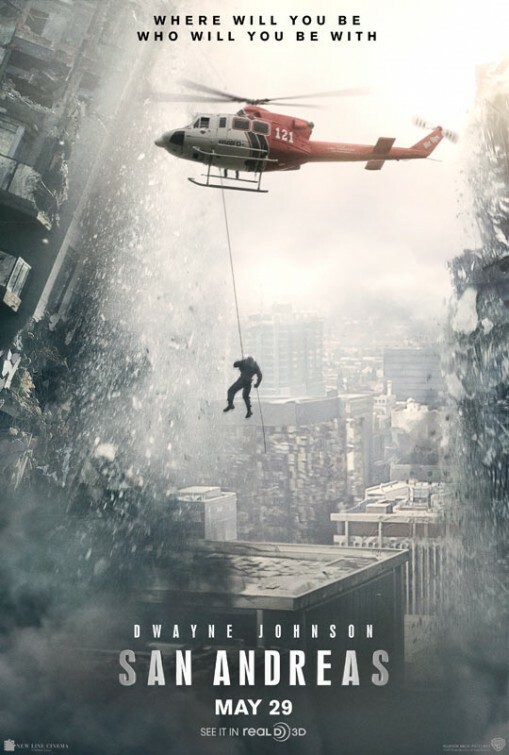 The film follows Ray Gaines (Dwayne "The Rock" Johnson) as an earthquake -- well multiple earthquakes -- erupts in San Francisco. His daughter Blake (Alexandra Daddario), and his ex-wife Emma (Carla Gugino) are caught in the midst of the destruction. As you might expect, Ray embarks on a mission to find and save them. Better that, I suppose, than trying to defeat an earthquake, the logistics of which I can't quite wrap my head around, although stranger stories have definitely happened. Anyway, Gaines actually has some skills to fall back upon. He's a rescue worker in Los Angeles, and he's already on his way to Nevada help out after a major earthquake has destroyed the Hoover Dam when a huge earthquake hits L.A. and San Francisco. Worried about his family, he turns back -- and, remarkably, shows up just in time to pick up Emma from falling off a crumbling building. Together, they search for their daughter, who has been abandoned by Emma's jerk of a new boyfriend and is Eventually saved by a pair of British brothers (Hugo Johnstone-Burt and Art Parkinson), who end up serving as the film's the comedic relief. Oh, and Paul Giamatti shows up, too. He plays the token scientist who develops a new way to predict earthquakes -- only, y'know, no one believes him until it's too late. None of it is particularly original, although I can't imagine originality was the intent here. The aim here is obviously the action, which, to San Andreas's credit, at fun enough to watch -- at least at the start of things. The first earthquake's pretty great, but from there, with each new set piece, the film just repeatedly aims to go bigger and bigger. In turn, the later action scenes end up just feeling silly. At what point, you may be asking yourself, does seeing a bunch of computer-generated people getting crushed by falling San Francisco skyscrapers become tiring? Trust me, it happens faster than you might expect it to. It's just way too much. All of it. Two earthquakes end up hitting San Francisco, because, no, there can't just be one. There's even a tsunami, too, although I'm not sure how the science even works there. But, whatever, we get to see The Rock climb up a giant wave on a speed boat, so it's all even, right? Not quite. Not on top of this paint-by-numbers plot, which is a lost cause, even in the face of some valiantly vulnerable and poignant moments from Johnson during the film's few in-between action moments. Say what you will about this being "just" a disaster movie, where plot and characters don't really matter. I'm sorry, but these things do matter. There are plenty of examples out there; you very much can make a good action film and still have a decent plot with dynamic characters. San Andreas sorely lacks in this part. In turn, while it's literally a film about the ground breaking, it's about as far from ground-breaking as can be. Oh, and don't waste your money on the 3D screenings. It really doesn't add much. Grade: C-, but only because I like The Rock.